short girl, long island. : Childhood Crushes and Davy Jones. As a small child, I had countless crushes. Before I turned ten, I daydreamed that I would marry Scott Baio, John Stamos, Mark-Paul Gosselaar, Emilio Estevez, even Paul McCartney. Michael J. Fox and I had the same initials - he was my density (if you don't get that, please stop what you are doing and watch Back To The Future - immediately). I also fell in love with The Monkees - a late 60s television show, featuring legit musicians (although for aesthetic purposes, the musicians had to learn different instruments in order to make the lineup more appealing to the masses). The Monkees were Micky Dolenz, Davy Jones, Michael Nesmith, and Peter Tork. I had a collective crush on all of the band members, which could also explain why most of the guys I've dated were skinny musicians, each with a unique sense of style. I wasn't born when the show was in its prime, but thanks to MTV and Nickelodeon, the show made a comeback in 1986. Sadly, on February 29, 2012, Davy Jones died of a heart attack in Stuart, Florida (the same town where my teenage self would drive aimlessly, in order to clear my cluttered mind). I waited a few days to post this, because I knew the internet would be flooded with posts regarding Jones' life and legacy. In fact, I thought about forgoing a post about this, because I didn't want this to be something that no one bothered to read. 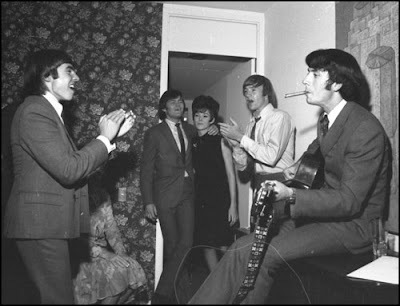 Then, last night, I heard that my younger cousin, Marissa, had just discovered The Monkees, in wake of Jones' passing. She made a comment to her mom, stating that she thought he was cute. Ah, a girl after my own heart. Its funny, because I only recently reconnected with this part of my family, but its like she's a mini-midge, only eighteen years my junior. My cousins sat in the living room at my mother's house, The Monkees marathon blaring from the television, as they took turns working out on my mom's exercise bike. I don't know what the fascination was with the bike, but three of them took turns breaking a sweat, then complaining to the adults that they were sore. I told them to stretch, but I doubt they were listening to me. As I drove home, I thought about how much I loved watching The Monkees as a child, dancing around to the music, laughing at the situations the gents got themselves into. How could I not pay tribute? The clips below are from The Brady Bunch episode, Getting Davy Jones, which aired in 1971, and Last Train To Clarksville, which aired on The Monkees in September 1966 - gems I was able to feast my eyes on, thanks to the beauty of syndication. ...let’s not get ahead of ourselves here. The David has stepped beyond my view causes me the sadness that it does many of you. I will miss him, but I won’t abandon him to mortality. I will think of him as existing within the animating life that insures existence. I will think of him and his family with that gentle regard in spite of all the contrary appearances on the mortal plane.